Welcome to Inthewoods Sugar Bush! The 2018 mapling season is almost here!!! We are a family owned and operated maple syrup producer located on the shores of Lake Michigan, in Manitowoc, Wisconsin. We manage over 17 acres of land, and have approximately 1300 maple trees tapped. As a member of the Wisconsin Maple Syrup Producers Association (WMSPA), Inthewoods Sugar Bush has received multiple blue ribbon awards for our pure maple syrup. 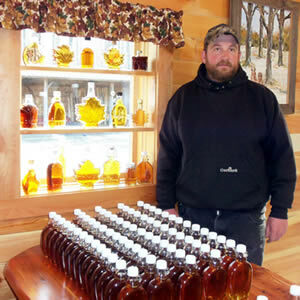 We offer locally produced maple syrup in a variety of sizes. Our specialty is light amber, but we also make all grades of pure maple syrup. 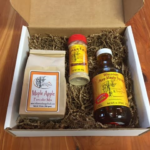 In addition to pure maple syrup, we also offer granulated pure maple sugar, pure maple leaf candies, and pure maple cream. Inthewoods Sugar Bush takes pride in all of our maple products. We use the latest technology to ensure the highest quality results. Inthewoods Sugar Bush uses vacuum tubing to collect sap from the trees, and the sap passes through reverse osmosis equipment. Our equipment is food-grade, ensuring that we use less fuel per gallon of syrup produced. All of the firewood used to make our pure maple syrup is harvested from our woods. Our sugar shack is safe and clean, and inspected annually. Stop in for a visit during the sugaring season…you won’t be disappointed! One gallon of syrup requires approximately 40 gallons of sap. A maple tree is usually 40 years old before it is tapped. Visitors are always welcome during the sugaring season. Please call (920) 242-9050 for sap flow information and boiling times.